Dimapur, April 17 2015 : In what would likely to produce a far-reaching consequence in the current political development in the state, president of the BJP national party, Amit Shah has categorically stated that the BJP would never ally with the Opposition Congress. He further asserted that "there can never be the BJP and the Congress in the same camp or in the same government" . In his median visit to Nagaland today, the BJP national president, while interacting with the BJP party workers at Chumukedima informed that the BJP would never go together with the Opposition Congress nor would be in the same government. He said this at a time when the Opposition Congress in Nagaland publicly stated that it would join the NPF-led DAN government in Nagaland. The Opposition Congress disclosed this after it had voted in the favor of the "Confidence Motion" moved by DAN Chief Minister TR Zeliang on February 5 on the Floor of Nagaland Legislative Assembly. Interestingly, Chief Minister Zeliang also said on couple of occasions that he would have a "party-less government" in Nagaland. Because of this political development, the BJP in Nagaland had earlier cautioned that they would not be part of the government where the Opposition Congress was there. This twist and turn of political development has already thrown confusion in the minds of the people in the state. While interacting with BJP party workers at Chumukedima, Shah also discussed on the law and order situation and developmental aspects of Nagaland. 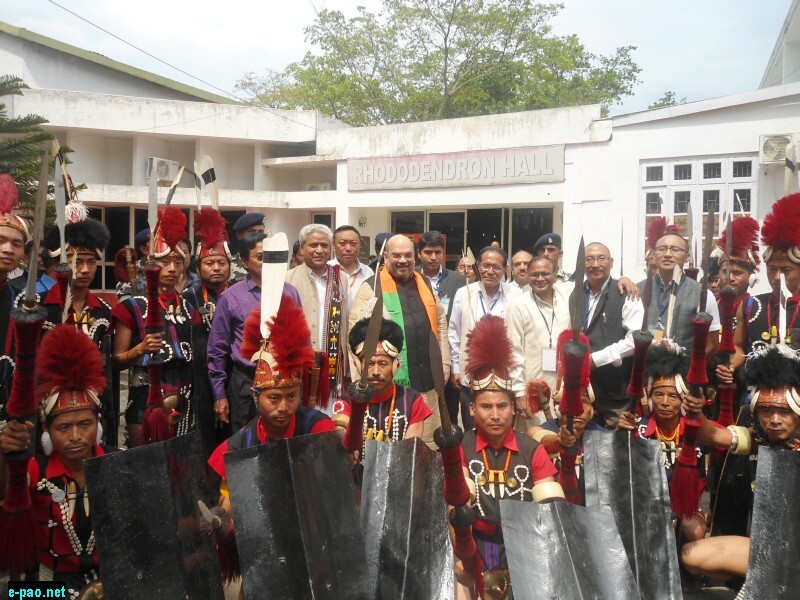 He said North East (NE) including Nagaland did not lack funds and the Central assistance had been coming in the region. Unfortunately, these funds did not percolate down on the ground due to corruptions, he said and urged the state BJP workers to sincerely check corruption so that developmental activities went smoothly. On his arrival today, Shah accompanied by Ramlal, BJP national general secretary was warmly welcomed by Dr.Chuba Ao, state party president, BJP MLAs, Dr..TM Lotha, Imtilemba Sangtam, Paiwang Konyak and Mhonlumo Kikon and party workers from all 11 district of the state in traditional Naga style. * The sender of this news can be contacted at nepsonline(at)yahoo(dot)com .